Most Yahoo! Search Ad Clicks Are NOT From Yahoo! Danny Sullivan mentioned Efficient Frontier research which stated that 55% of Yahoo! Search ad clicks from last week were from syndication partners. If you normalize the above Yahoo! numbers you will see that search clicks convert nearly twice as well as their syndication traffic does. Imagine how ugly those numbers were before both Google and Yahoo! aggressively fought click arbitrage. Yahoo! let advertisers take the shaft for years and years, and only started caring this year after Microsoft's offer to buy them out. What type of clicks are likely to be driven by arbitrage and other syndication partners? Arbitragers are more likely to go after high value keywords, thus driving down their value. Buying a valuable keyword like "mortgage" on Google costs much more than it does on Yahoo!. I did not enter bid prices in the above tools. Those were the default bid prices the tools suggest for mortgage. The difference in click cost is an indication of how much Yahoo! is undermining the value of their own traffic to prop up syndication partners that funnel dirty traffic through the Yahoo! Search Marketing ad network. Even when I slid the Yahoo! tool all the way to the right it said the estimated click cost was $4.98 - less than 1/3 of Google's suggested price. Yahoo! has to sell 3 mortgage clicks to make as much as Google makes from 1, but Yahoo! sells a couple of those clicks through syndication partners which keep most of the ad revenue. Because Yahoo! makes it hard to opt out of search syndication they are essentially paying shoddy syndication partners 70 to 80% payout for arbitrage that builds volume, but destroys the value of Yahoo! Search. Put another way, a Yahoo! click for mortgage is worth the same $15 that it costs on Google, but it goes for less than $5 because Yahoo! forces advertisers to eat junk traffic too. If Yahoo! virtually killed off their syndication partnerships (at least all but the cleanest ones) their short term revenue might decrease, but their click values & click prices would sharply increase. Google AdWords to the Rescue? Yahoo! mentioned the possibility of syndicating Google ads if the Google ads paid more, but if they do that then Google gets Yahoo! 's best inventory while Yahoo! Search Marketing advertisers buy random mystery meat traffic. What exposure do you get from a Yahoo! Search Marketing ad account if your ads do not appear on Yahoo!? Sounds a lot like Looksmart to me. Yahoo! already has less traffic and lower quality traffic than Google. If they outsource their best traffic to Google savvy marketers will quickly talk about how Yahoo! has low quality and you should just advertise with Google. The perception of market decay and market whispers will only accelerate the decay. When it comes time for Yahoo! to renew with Google they would have lost most of their leverage. Once again Yahoo! may find a way to pump their short term numbers, but it is not a strategy they should try building their business around. The first step to restoring value to their search results should be making it easy for advertisers to opt out of ad syndication. If they syndicate Google AdWords most advertisers should just opt out of Yahoo! all-together. What Should Yahoo! Search Marketing Do? 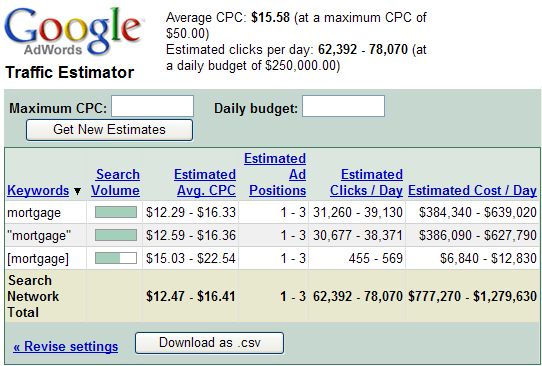 Not enough time to make a decisiion other than Adwords? As a frustrated Online Manager looking after several corporate sites I only ever have time to dip my toe into the PPC market - if I am honest I spend more time reading about it and less time doing it.......its more interesting that way. Consequently I appreciate the huge potential, know what I need to do, but never quite get there as I am always flat out with other committments (sounds like an excuse now I've written it down?). I like the idea of having 8 hours a day to research, define and implement a Online Marketing strategy. But in the interim - while I convince my MD I need a team of Online Marketers - our venutre into the PPC world is down to me. I've read a lot recently to suggest Google as the 'only' PPC campaign worth considering - and while I'm not sure that is true - I don't have the time to disproove it. There must be opportunity outside of Adwords for advertisers with certain products, certain services, advertising at certain times, with a certain budget hoping to reach a certain audience.......isn't there? I still advertise with Yahoo!, but I typically bid lower there than I do on Google. Yahoo Syndication clicks appear to be closer in value to Yahoo search clicks than Google Syndication clicks are to Google Search Clicks. Your point about the auction model setting the CPC is dead on. Efficient did not provide nearly enough data to compare between Yahoo and Google or to let us know whether these clicks were before or after the invalid click discount, but the market value of a click is an excellent indicator of the relative conversion value. The interesting hidden story in the Efficient statistics is that they demonstrate that traffic from Google Search (real search traffic) converts at 208% of the rest of the traffic from Adwords. Yahoo Search clicks seem to convert at 169% of the Yahoo partners traffic. On the face of this, the Yahoo partners would seem to produce traffic that is closer in quality to Yahoo search. Unfortunately, the overall value of Yahoo clikcs appears to be 30-50% of that of Google. But the big difference (worth noting over and over and over again) is that Google allows you to opt out of search syndication, whereas Yahoo! requires you buy it. When you say Yahoo Syndication Partners, do you mean those sites that include yahoo ads on their sites, like a google adsense publisher? Not sites in the Yahoo! Not sites in the Yahoo! Publisher network, but stuff in what they sell as search (though much of it is not actually search). This has been going on for years now and my biggest gripe with Yahoo!. It's also an issue that can be easily fixed by allowing users to opt out of the garbage search network. They threw advertisers a bone with the ability to block 250 domains, but anyone advertising in bulk will hit that limit within a few days. Another area that study doesn't point to is that a good percentage of the "seach network" clicks in Yahoo! is foreign traffic. We are seeing about 40% of non-Yahoo traffic coming from China or Eastern Europe. We are being charged for this traffic as well. It's sad because there are a lot of people who have pulled out of Yahoo! or just keep bids real low. They've taken the approach of screwing advertisers by having zero quality control on their search feeds and little to no click fraud prevention. If they would have built their system for advertisers, they would be in a much better position right now. I can't agree with you more about the difference that being able to opt out makes. The point I was making is that the Yahoo partners traffic is closer in quality to Yahoo search traffic. Yahoo search traffic seems to be about the same quality as Google search network traffic. Google defaults to include you in search syndication and the content network at the same bid...I think of it as a stupidity tax. If Yahoo would allow us to set different bids for each distribution channel, I suspect the revenue hit would be very short term. Right on Aaron, I've noticed lower conversion rates with Yahoo! (though Yahoo is more cost-effective, according to my spreadsheets). o/t question, What did you use for that survey - is it opensource? The above survey was from Efficient Frontier. And then I use the tools provided by Google and Yahoo! which estimate click value. Somebody else gets it ! Yahoo is a “dead man walking” because they got piggy and sold their soul to the scammers and quick buck artists of the world posing as syndication affiliates. Yahoo has been willingly participating in the scheme and as a co-conspirator deserves to be part of a sad history of companies who CANNOT be trusted. Good Riddance to Yahoo. This has been going on for years and the chickens have finally come home to roost. This situation is a great opportunity for Microsoft if they are wise enough to understand that advertisers need and want a counter balance to Google. The chart in this article clearly shows Microsoft with smaller numbers but with good clean clicks coming from potential customers who want information. MICROSOFT – PLEASE LISTEN – Do not buy Yahoo, it has already committed suicide. Microsoft has to do two things to succeed in the PPC marketplace. MS can get a third of the PPC business just by being an honest vendor. 1) Provide an easy way for advertisers to clearly stipulate “pure search” without syndication. If you want to offer Syndication, give advertisers the ability to “opt-in” rather than opt-out. This forces Syndicators to build trust to get revenues. 2) Let all potential advertisers know the ROI value of Microsoft search. Hire someone to do this if you cannot find internal sources. Advertisers have already spoken regarding the fraud perpetrated by Yahoo and have voted with their pocketbooks. As far as #1 goes...as long as they vet their partners then I think they will still be fine relative to the marketplace. If they make all the partnership stuff opt in instead of opt out they will either not be able to get many syndication partnerships OR they will have to subsidize those relationships...both options are unattractive from a business standpoint. BINGO - The number of sydicators is precisly the problem. Too many syndicators. It is not about volume, it is about numbers and real ROI. This is exactly why advertisers (just like me) are voting with their pocketbooks and Yahoo revenues (and stock prices) will continue to fall as people do not like to subsidize con artists and scammers from all over the globe as well as those playing games on mom's computer in the back bedroom. Real clicks from real buyers is what an adveriser wants, not huge numbers of scamming syndicators. With an opt-in ability the advertisers can control this problem. Yahoo has already shown they are only concerned with short term profits. Well the short term is up and the fat lady is singing her heart out. Hoo Raa. My point is that Microsoft can take real advantage of this situation by simply being an honest broker and giving advertisers real clicks from real buyers. I see things slightly differently. Many advertisers don't care to bother with Yahoo because volume is too low (especially relative to Google). If you're not in a megamarket like mortgages, ringtones etc, you may spend an equal amount of time managing the campaign, yet see smaller returns on your time. That's why, imho, they put up with the syndication - it shows extra volume. Longterm, they need to figure out how to boost their search volume. According to Compete.com, they have equal daily traffic to their site to Google, or even slightly more. The problem isn't a lack of traffic, it's an inefficient monetization. How can you find out which traffic is coming from the syndicators so you can block it? Thanks! I still advertise with Google.